Traveler’s diarrhoea (spelt diarrhea in America) usually affects people when travelling to new destinations abroad. People tend to suffer from diarrhoea within a couple of weeks of their stay in a new country. Diarrhoea is largely a result of bacteria, and most people recover within 3-5 days. During this time it can be extremely uncomfortable. Diarrhoea can be caused from eating foods or drinking water that is contaminated. When traveling overseas, trying to find a doctor to get a prescription can be difficult especially if you are already suffering from a bad case of diarrhoea. It’s always a good idea to be prepared when travelling and making sure you have medication to treat diarrhoea can come in handy. You can buy diarrhoea treatments online safely before you leave home. You can buy the medications individually or together as the ‘the traveler’s diarrhea pack’ contains everything you need to treat diarrhea when travelling. The pack contains an antibiotic, oral rehydration aids and medications to provide relief from symptoms such as nausea and loose bowel movements. Having diarrhoea can cause dehydration, so it’s very important to drink plenty of water when taking medications to treat diarrhoea. Ciproxin antibiotic can reduce the length of time you have diarrhoea. The active ingredient is ciprofloxacin that attacks the bacteria directly that causes the diarrhoea. Dioralyte contains salts including: sodium chloride, potassium chloride, sodium citrate and carbohydrates. These ingredients help replace bodily fluids and salts that are lost as a result of diarrhea. Imodium treats diarrhoea along with gas, bloating, cramps and pressure in the stomach and bowel. 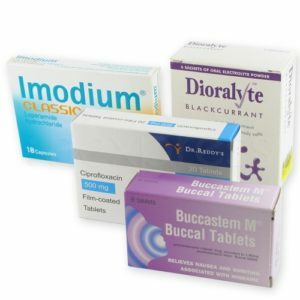 Buccastem will help provide immediate relief from nausea and vomiting that can be caused by traveler’s diarrhea. Bactrim (Sulfamethoxazole / Trimethoprim) is an antibiotic combination that treats bacteria in the body. It is commonly called TMP-SMX drug. It can be used to treat many different infections including: urinary tract infections, bronchitis, ear infections, travelers diarrhea and pneumonia. A typical course of Bactrim is a 3-day course to clear up an infection. Bacteria such as Escherichia coli (E. coli), Campylobacter, Shigella, or Salmonella are the most common causes of traveler’s diarrhea. This bacterium is found in water contaminated by human or animal stools. Drinking water, water used to wash food, or irrigation water may be affected. When you eat food or drink water that has been contaminated you are more than likely to get diarrhoea. Common sources of bacteria that cause diarrhea are uncooked food, raw foods, contaminated food or contaminated water (including ice cubes). How do I buy diarrhoea treatments online? It’s a very simple, free and discreet process to buy diarrhoea medications online. You will have to complete an online consultation to purchase prescription medications. This will only take a few minutes and replaces the normal face-to-face consultation you would have with a doctor. After you have been approved for the medication, it will be dispatched from the chemist to arrive to your door within 48 hours. This will save you time and money guaranteeing you will be ready for your trip.